In the tiny space between the constellations Virgo and Leo lies a bounty of bright galaxies. In the northern spring, an astronomer's fancy turns to galaxies. As the winter constellations of Orion, Canis Major and Gemini move off-stage to the right, the spring season brings the less brilliant but fascinating constellations Leo and Virgo on stage from the left. In a small space in the sky, between Denebola, the easternmost star of Leo, and Vindemiatrix, the northernmost star of Virgo, lies the richest part of the sky for galaxy hunting. Although a few galaxies were known in this area before the time of Charles Messier, comet hunter of the 18th century, it wasn't until he turned his telescope on a comet there in 1779 that he realized what riches were to be found. On the night of April 15, 1779, Messier discovered three new galaxies, to which he assigned the numbers 58, 59, and 60 in his famous catalog. Over the years that followed, Messier returned again and again to this patch of sky, and eventually catalogued no fewer than 23 galaxies within it: 11 in Virgo itself, plus 12 more in the dim neighboring constellations of Coma Berenices and Canes Venatici. If you are new to galaxy hunting, you will do well to practice on some of the brighter galaxies in a less crowded part of the sky, such as Messier 81 and 82 in Ursa Major, and the five galaxies in Leo, Messier 65, 66, 95, 96, and 105. Even these galaxies will be a challenge for beginners, as they are probably fainter than anything you have ever looked at in your life. Once you know what a galaxy looks like in your telescope, you will be ready to tackle the Virgo Cluster. Here the problem is not seeing galaxies, but trying to figure out which is which. But go at it slowly and carefully, and you will be able to sort them out. Although you might be able to see some of these galaxies with binoculars from a dark sky site, you really need a telescope with at last 6 inches aperture to see them well. The best place to start is Vindemiatrix, Epsilon Virginis. This star is about half way between Arcturus and Denebola in Leo. 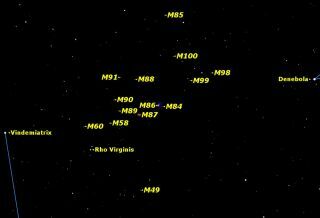 Move a little to the right to find Rho Virginis, which is at the center of a distinctive asterism, or group of stars. It looks a bit like part of a Tinkertoy: a bright star with three surrounding stars like spokes. The brightest of the three spokes points northward towards a trio of galaxies in a line, Messier 58, 59, and 60. Once you're in the Virgo Cluster, there are very few stars to guide you, and it becomes a question of "galaxy-hopping" rather than star-hopping. Follow the line formed by Messier 60, 59, and 58 to the right and you’ll find Messier 87, the jewel of the whole cluster, and one of the largest and brightest galaxies in the sky. It is surrounded by fainter galaxies. Identifying them becomes a challenge, and a good star atlas is essential. In fact, this area is so rich and complex that most star atlases provide an enlarged scale chart of it. One of the best is in Sky & Telescope's Pocket Sky Atlas. With dark skies, a good telescope, and a detailed chart, you should be able to observe all 23 of the Messier galaxies in the Virgo Cluster. Happy hunting!